This is it… the Zenyatta collectible everyone has been awaiting. Introducing the official first edition Zenyatta Plushie. This heartwarming rendition pays tribute to Zenyatta’s present maternity and the anticipation of the impending heralded birth of the “Queen’s” first born. The tandem plushie, the first of its kind, captures Momma Z in an affectionate and nurturing nuzzle with Baby Z. 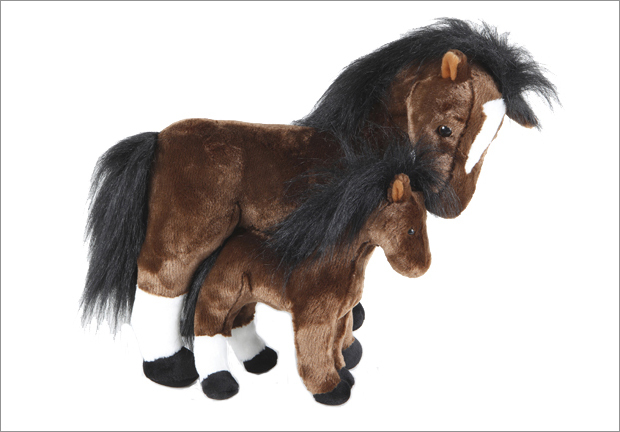 Since the world has yet to see the future foal and the actual color and markings of this highly anticipated next generation of racing royalty, the first edition plushie offers the larger version of Zenyatta identically duplicated in foal form. We expect subsequent versions of the duo will feature the markings of the actual foal once he or she arrives, but for now Zenyatta fans can enjoy the two-for one bonus of this collectible first edition. The endearing keepsake features a super-soft mahogany plush, detailed construction, and superb stitching that separates the Zenyatta plushie from the rest of the competition. From the hind white socks to the distinctive blaze on Zenyatta’s sweet face, both the mare and foal plushie contain the distinctive features familiar to all her Zenyatta fans. Momma Z measures an ample 15″ tall by 14″ long while Baby Z is 10″ wide by 10″ tall. The two piece tandem are connected by a concealed, yet easily detachable, plastic pin tag to allow for the enjoyment of each individual plushie separately. Each plushie comes with its own individually numbered foal birth certificate – inspired by Zenyatta’s original jockey club registration papers. And for a limited time as an early Valentine’s Day bonus, certificates will be double hand-signed by trainer John Shirreffs and his wife, Moss Racing Manager, Dottie as a complimentary Barn 55 Signature Special. Zenyatta plushie = the working woman’s bronze. I love you dear friend…..12th-Heart. Brilliant deduction. Would love the bronze, but I am excited about the Plushie too! They are TOO CUTE! Can’t wait to get mine and nuzzle both of them! oh my goodness! That is adorable! Going to need to get a few of those. Have just orderd my plushie and can’t wait to get it. I’ll be ordering the second edition as soon as one is available. It will be ok with me if the foal looks just like Mom, our Queen Z. Couldn’t possibly be prettier than Mom. Thanks for making this available to us your fans. This is truly just too precious for words….Thank you! Yup I broke down and am getting another stuffed animal! This is so cuuuuutttteeee! And I like how in the future editions those may change once they see how the baby’s marked. Heavens with all the money my families spent they should be able to buy a carrot field for Z! Or is that a pear tree or two? So love the new plushie! Mine is on order and can’t wait to have it! Absolutely adorable. Can’t wait to see the future editions/additions! :-) Can’t get enough of Queen Z and love all the merchandise! I just told my husband not to bother with a Valentine’s day present cause I just ordered my Plushie and that’s all I need. Wow, it does not get cuter than this…definately TOO CUTE!!! I excitedly waiting with anticipation. I just order my plushie and the Queen’s dancing poster. She is so beautiful. God’s perfect masterpiece. Thank you Dottie & John for your signatures. You are so special. Hugs & kisses to you Mama Zenyatta and Mama Tasty. Valentines Day is not that far away. I have three reasons for my excitement lately: One, you were the most intriguing horse for 2011 Z (yippee), two, the anticipation of your special baby z’s arrival, and now three, having a plushie of you soon in my arms!! These plushies look great! I am going to order one one of these days! That is so cute! Where can I order one? I am not buying a toy replica of zenyatta. What a disgrace. Can the toy dance like she did? (Shame on you. Hilary Clinto quote.) Why make more money? Please don’t send her to a glue factory. Wouldn’t surprise me. Is that money, too, for you? Announcing the zenyatta plushie. Can I be sent one free? I am so saddened by anyone associated with the horse wanting to make $ on a plushie and the horse’s fame and name. What is wrong with our society? Aren’t the videos enough? Yes, horses were in my family. I wouldn’t even make a bumper sticker advertising the horse. What is wrong? Corporate greed. And to think this horse danced better than anybody. Does the plushie dance? Shame on you. (Hilary Clinton quote). Long live Alydar, Affirmed, and now Secretariat–money made by someone from the past. Anyone seen Chris Antley or Michael Baze? Also victims of a tough industry. The Mosses (owners of Zenyatta) have set up a foundation and profits from the sale of the plushies and other Zen products go to support equine rescue groups and other charitable causes. They have taken bids to visit Zenyatta that support local chariites in Kentucky. Jerry Moss owned A & M Records along with Herb Albert; the Mosses don’t need any money from this site as they are multimillionaires. To horselover: their proceeds go to charity. What kind of person would ever suggest they would send her to a “glue factory.” I think you re on the wrong site. Maryland that Colombia Green ASPCA recused. Her name is Notinrwildestdremz. She has survived and is loveingly trained. condition to ever race so we have hopes she can support them. Charity comes in many forms and usually good things happen. Support retired racehorses when you can. Thanks and Good Luck to all. Beautiful plushies. Waiting for the little prince or princes. Must be due around March 4th and I can’t wait for the announcement. Stay healthy Zenyatta and may the birth go easy. I am positive that I won’t be the only middle-aged lady tucked-up tonight with my beautiful new plushie. Zenyatta and foal are adorable beyond words! I absolutely LOVE them! And the birth certificate signed by Dottie and John, too! Z’s foal will come on March 13th @ 11:00 pm and it will be a bay colt, with one white hind sock and a crooked small blaze. Just recieved my plushie and it is fantastic!! Thanks team Zenyatta for making this available to us fans. I will cherish it. The plushie is larger than expected and beautifully made. I am crazy about him, unfortunately so is my dog, (a former herding farm dog) so Z and baby have to be put on high shelf…eagerly awaiting the birth of real foal…Thank you for all you do.. Thank you for a very pleasant summer, girl. You were spectacular! I wonder if you realize how great you are? We’re all waiting for your baby. Take care and God bless you both. Has anyone watched Luck lately? Who does the horse Delphi really represent? Please…please make sure you order tons o’plushies when “L’il One” arrives.